شبكة ضد الإلحاد Anti Atheism | Religious Terrorism! Who is the Real Culprit? عرض المقال :Religious Terrorism! Who is the Real Culprit? اسم المقال : Religious Terrorism! Who is the Real Culprit? Pakistan is passing through a worst crisis of its history. At this point in time, with Golden Jubilee celebrations going on, various issues as well as internal and external enemies are threatening the very existence of this God-gifted country which came into being in the name of Islam and sacrifices of thousands and thousands of lives. At no time in history had Pakistan gone through such crisis. The problem that is being highlighted in this article has worried and distressed masses and authorities alike. Everyday in the newspapers we read reports of acts of 'Religious Terrorism' being committed by unknown assailants, who suddenly arrive on the scene, usually places of worship, fire indiscriminately and disappear. Many innocent people have thus suc*****bed to such attacks. Opposing religious groups are being blamed for these crimes. Question is: Can any sensible Muslim be so insensitive to kill innocent persons? Somewhere behind these acts of terrorism, definitely there are other factors also operating. We have noticed that as a result of this wave of terrorism, internal as well as Foreign anti-Islamic forces have seized the opportunity, on the one hand, to use religious organizations for their nefarious designs and on the other, to put the blame of these terrorist acts squarely on them. Several birds are being killed with one stone. Public and authorities are being pitched against religious organizations, their activities are being clamped, basic and ideological differences are being played down and religious organizations are pushed underground. Has anyone thought whose hands are operating behind such activities? In the following lines I will try to show you another possible face of this terrorism, which may perhaps be the rel culprit. Anti-Islamic and anti-State activities of Qadianis/Ahmadis are well known. They have special avulsion and hatred for Pakistan, its people and its religious scholars/Institutions, whom they disparagingly call 'MULLAN'. It was the people of this country who have affixed such a seal of infidelity and KUFR on their foreheads that it doesn't come out no matter how hard they try. This curse of infidelity and kufr follows them wherever they go. The historical decision of the National Assembly of Government of Pakistan in 1974 and then the further amendments of 1984 has been a sort of nail in their coffins. Thus the evil designs of anti-Islamic forces and their 5th columnist, the Ahmadiyya Movement, have been quashed. With a stroke of pen, Mirza Ghulam Ahmad Qadiani, his followers (qadiani/ahmadi/lahori/mirzai) and all other past and future claimants of prophethood after the Holy Prophet Muhammad SAAW have been declared out of the fold of Islam. Other Muslim nations followed suit and today followers of Mirza Ghulam Ahmad cannot enter the Holy cities of Makkah and Madina Munawwarah, except by deception. Qadiani creed does not let go of any opportunity to harm Pakistan and its people. Examples of such revengeful attitude are all over. Their relentless anti-Pakistan propaganda, false publicity of child labor or concocted cases of persecution of minorities at various international forums has seriously jeopardized the trade of Carpets, Surgical instruments, Sports goods. On several occasions, Qadiani spies have tried to steal the secrets of nuclear facility at Kahota. These are just a few examples of this Qadiani policy. There is no doubt that there are hidden hands behind the recent wave of Religious Terrorism in Pakistan. I have a strong suspicion that Qadianis/Ahmadis are behind these killings. In their eyes, we the Pakistani Muslims are their foremost enemy. Hence killing Muslims, specially the ones who are responsible for their indictment as KAAFIR, is not a sin. Further proof of such an involvement in so-called Religious Terrorism comes from the statement of Mirza Tahir Ahmad, which appeared in a recent issue of Al-Fazl International published at 16-18 Gressenhall Road London SW18. Perhaps most of the readers are not aware of the history of Lekhram. I will briefly relate this story here. Lekhram was a young Hindu Pandit (priest) who came to Qadian when Mirza announced that anyone who wants to see the truthfulness of Islam and his divinely-ordained powers, should come and stay with him for one year, during which time he will definitely see some sign !! If no sign is exhibited during this period, then Mirza will admit his failure and pay a penalty. Several people responded to this offer and Lekhram was one of them. Lekhram came and stayed in Qadian for some time and demanded for a miracle or a sign to be shown. However not unexpectedly, Mirza was unable to fulfil this demand. Every day he used to come to Mirza's house demanding the sign and everyday Mirza's failure gave Lekhram a chance to ridicule his powers, Islam and the Prophet of Islam. "...He (Lekhram) came to Qadian. I advised him repeatedly that it is not nice to attack the Pious Prophet of God but he was a disbeliever of God's Might and Power. He did not care to have fear of God and see the right path with honesty. And his impudence increased and save for mockery and jeers and profanity he had no other way .... thus God decided to assassinate him." "He stayed in Qadian for nearly 25 days and could not stop himself from using harsh and abusive language. In the bazaar, sitting in the path of Muslims, he used to utter obscenities against Our Blessed Prophet and used to utter words to provoke Muslims…..Those days several embarrassed (ghairat-mand) Muslims came to me that this man is openly uttering profanities against our Holy Prophet and I saw that they were quite out-raged….and Lekhram adopted this way that he used to come to my house and demand some sign and miracle and used to pass extremely ridiculous and funny remarks. Now a Muslim who is a true Muslim can understand how difficult it is to be patient at the habits of a man who utters obscenities about Islam and Holy Prophet and daily expresses insulting and scornful remarks about religion, but I remained calm…". Amazing that this so-called divinely-ordained reformer of Islam, who claimed to be inebriated with the love of Holy Prophet , an 'Aashiq-e-Rasool', even Lekhram's unfettered mockery and caustic attack on the Prophet of Islam failed to arouse his GHAIRAT. If he were a true prophet of God, truly delegated by All-Mighty, such occasions would have compelled him to exhibit some sign, some miracle, to prove the truthfulness of Islam and thus protect the honour of Holy Prophet. But he knew the truth behind his claims, he knew that he can never show any signs, so all he tried was to defuse the outrage felt by Muslims. "It was not a prophecy, rather I prayed for his death and I received a reply from God that he will die within 6 years." Mirza prophesied the murder of Lekhram in 1893 and SIX years later, on 6th March 1897 he was stabbed to death by a knife in abdomen. 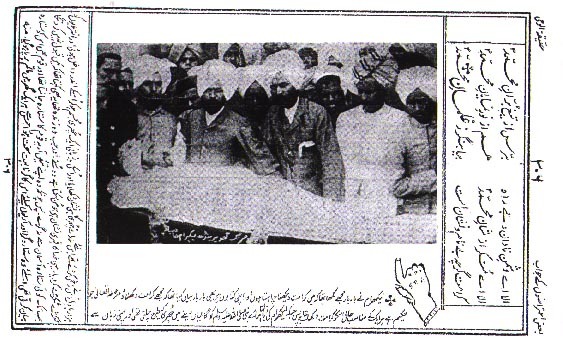 Triumphantly, this Egotistical Messiah of Qadian published the photograph of Lekhram's dead body in Haqeeqat-ul-Wahi, Roohani Khazain vol.22 p.306, an act quite befitting his character. Click here for this photograph. "This Juma which is the day of Eid, is reminding a Friday of hundred years ago which took place on the day of Eid….. Hazrat-e-Aqdas Maseeh Mowood prophesied in 1893 about Lekhram…In 1897, that Friday came which was the day of Eid…and the next day that 'Day of Eid' appeared … on Saturday a young man stabbed the abdomen of Lekhram, and not just plunged his knife but moved it inside in such a manner that all his intestines were severed and everything came out, about whom no one could understand and no clue was available; despite intensive investigations no one could discover that who was he, where did he come from, where did he go. He (Lekhram) was in such a bazaar that was the market of Aryas. It was a three-story house, on its upper story Lekhram was sitting and on the ground floor his wife was sitting and that boy who murdered him. That boy came a few days ago and pretending to be an Arya stayed with him. When this Saturday came, as is mentioned, he thrust a knife into his abdomen and moved it around and a loud cry came out of his (Lekhram) mouth. It was a such a distressing scream that his wife came running up the stairs, same stairs from which he (the boy) was to have come down and outside it was the market of Aryas. Due to such commotion, everyone gathered and there was no stairs in the back yard, anyone who would have jumped from the back would have been cut into pieces. Thus in such cir*****stances when his wife reached upstairs, she saw that Lekhram was writhing with his wounds and his intestines and whatever was inside had come out and there was no sign of the murderer. Downstairs after the commotion, people drew towards the house. When asked, they denied that anyone came down from the stairs or from the backyard. Thus it was then said that either he was engulfed by the heavens or taken up by the heavens because there was no sign of him on the earth. No one could ever discover his background, despite too much uproar by the Aryas; and secondly due to the opponents of Maseeh Mowood, it was impossible that police had investigated and not found any trace of him. Neither his origins could be traced nor his fate. Who was he? Where did he come from? And where did he go? All these are such mysteries which will always remain secret." "But Hazrat Maseeh Mowood saw in his dream that angel who was holding a knife in his hand and asking about Lekhram, because he was to receive this punishment for insulting Hazrat Muhammad Rasoolullah. Thus this is such a grand sign which appeared in 1897, 100 years ago. And today is also an Eid day and today is also Friday, so let us pray that God, with whom there is no paucity of signs, may also show such miracles in favour of Ahmadiyyat, because today not one Lekhram but hundreds, thousands of Lekhrams have been born . . . . now there are hundreds, thousands of Lekhrams who are day and night uttering abuses against Hazrat Maseeh Mowood and commits blasphemies and this is not coincidence but destiny that this year became the year of Mubahila, since when I initially challenged for Mubahila, it was not in my remotest thoughts that this is the year of Lekhram's assassination and for Lekhram this is the year of butchery by God's knife. Thus all these events that have amassed together suggest God's Nemesis is active and heavens will surely show some sign. Thus come let us pray together so that God, out of His Mercy, may combine that sign which he is going to show with our prayers as well and give us also its reward." The context of this whole story with reference to the present state of affairs in Pakistan and its implications are quite obvious. In the eyes of Mirza Tahir Ahmad, Lekhrams of today, not one but thousands and thousands of them, are those Muslims who are against the False Prophethood of Mirza Ghulam Ahmad. What a shameful statement that he considers all 1.2 Billion Muslims as Lekhrams of today and as such prays and encourage his followers too, to pray for their carnage. And who knows, someone in the Qadiani Hierarchy might have planned it as well. In the light of his statement it is obvious that the present wave of killings in various parts of the country are not sectarian violence, as the propagandists/media would have us believe. It is once again a very calculated move, as the speech of Mirza Tahir indicates. It seems that once again Qadianis/Ahmadis are playing in the hands of enemies of State and Religion. These fifth columnists are once playing with lives and blood of innocent Muslims. Their prayers indicate their intentions. Let us not forget the Qadiani Belief that: ALL THOSE WHO DO NOT BELIEVE IN THE PROPHETHOOD OF MIRZA GHULAM AHMAD QADIANI ARE KAAFIR, HELLISH, BASTARDS and OUT of the FOLD of ISLAM. Hence killing Muslims, especially the ones who are responsible for the indictment of KUFR against them, is to be desired, prayed and practiced.